Photo: Children from our India Girls Home are happy about the on-campus gardening projects which include a small banana grove. We are happy to report that construction of the new building for our on-campus high school at our main India campus will be finished this month. However, we are still facing some challenges with getting the high school fully accredited because there is not adequate land space to allocate a sports activity field and playground. With your support we hope to purchase one acre of land adjacent to our main campus where we want to create a new play space for the children — we lost the existing play area in order to construct the high school facility. Purchasing the adjacent land and building a new playground with new equipment such as a seesaw, swings, a slide, and a badminton court is also important because we need proof of a children’s sports field and playground in order to maintain our status as an accredited elementary school with the educational department as well. We are happy to report that we have already met the other requirements for our high school’s full accreditation: we purchased a school bus in August 2015, and we have all of the required facilities such as classrooms, a lab room, a computer room, and an office. 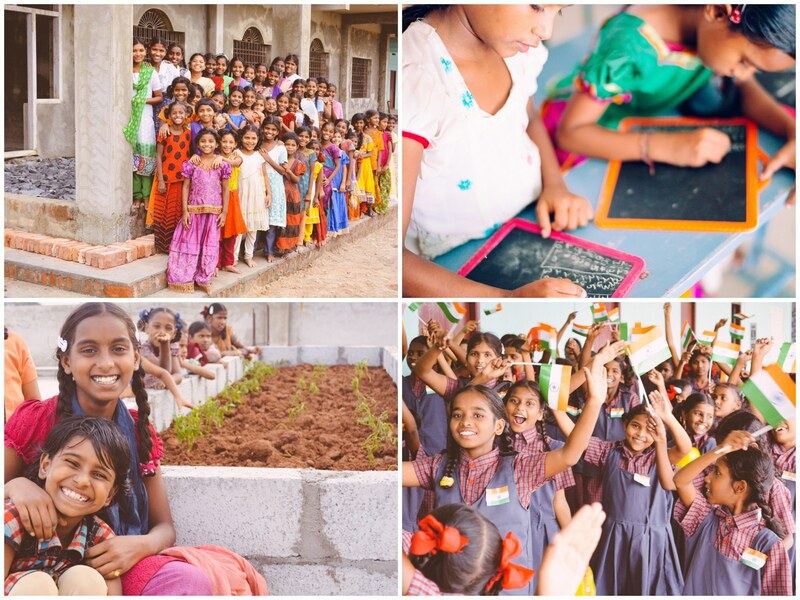 Photo inset: (Top-left): Girls at our India home are excited that construction of the new building for our on-campus high school will be finished this month. (Top-right): Our on-campus accredited elementary school provides a quality education to the orphans under our care. (Bottom-left): Our native team is preparing the ground level gardens and rooftop box gardens for the next planting season this month. (Bottom-right): Children on our campus celebrated India’s national festival, Independence Day, on August 15th. We are preparing our farmland for the upcoming rice planting season this month after we receive more rain, and we look forward to a good harvest in February. We will use the rice for the children’s meals, realizing a great savings that we would normally have to spend to buy rice at the market. After our last harvest of 4.6 tons of rice in January, we saved $2,800 — it may not seem like much, but in India, that’s 4.5 years’ worth of average annual income. Rice is a great source of sustainability since the average Indian consumes about 6.25 kgs (14 lbs.) of rice monthly, or about half a pound of rice a day. The children at our Hope Center and at our orphan homes consume 7,800 KGs of rice in their diets annually. If our harvest next year were to meet this demand, which we hope it will with the right weather conditions, it would save us around $5,250. Rice combined with lentils, another staple in the Indian diet, offers a nutritious source of complete protein, fiber, iron, and other essential minerals as well as Thiamin, Riboflavin, Niacin, vitamin B6, and Pantothenic Acid. Rice is both a source of profit and health, blessing our children’s lives. We are also preparing our ground level gardens and our rooftop box gardens for the next planting season this month — we grow crops such as eggplant, tomatoes, green chilies, curry leaves, and beans, and we expect a harvest of these crops in November or December. 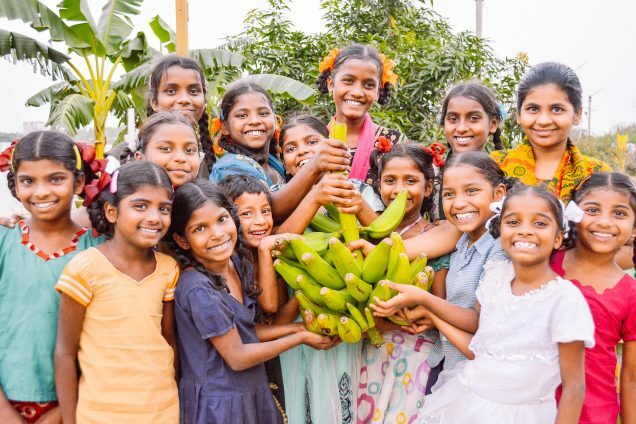 We hope to draw a decent profit (in savings) from the gardens, and we are thankful that the harvests of organic vegetables from our gardening projects can be used in the children’s meals. We are also planning to drill a new well at our farmland to improve irrigation, to help keep the land cultivated for growing vegetables before each rice planting season.